Watch House Cottage is a lovely mid-terrace cottage located in the pretty village of Knightstown on Valentia Island, County Kerry. The cottage can sleep four people in one double and one twin bedroom, and there is also a a family bathroom, and a ground floor wet room style shower room. The rest of the cottage is open plan with kitchen, dining and sitting area. To the outside of the cottage is off road parking for one car and a courtyard garden to the rear with furniture. 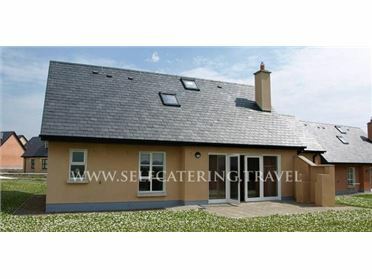 Located on the harbour, Watch House Cottage is a lovely cottage in a fabulous part of Ireland. Knightstown is the main village on Valentia Island, which lies off the coast of the Iveragh Peninsula in County Kerry. It is accessible from the mainland by ferry from Reenard Point, or via the road bridge at Portmagee. Knightstown provides restaurants, Irish pubs and local shops. It is also the departure point for boat and fishing trips. With around 650 residents Valentia Island stands out as one of the westernmost inhabited locations in Europe, and was the site of the first permanent communications link between Europe and the United States. The Island is famed for its magnificent 'Fogher' sea cliffs on the northern side of the Island, and the subtropical gardens at Glanleam House. Electric central heating. Electric oven and hob, microwave, fridge, freezer, washer/dryer, dishwasher, TV with Free-to-air channels, DVD, CD/radio, WiFi, selection of books and games. Fuel and power inc. in rent. Bed linen and towels inc. in rent. Travel cot and highchair. Off road parking for 1 car. Courtyard garden with furniture. One well-behaved dog welcome. Sorry, no smoking. Shop, pub and beach 1 min walk..